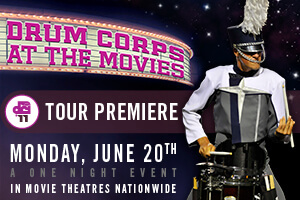 Fans of Marching Music's Major League from across the United States will have the opportunity to watch outstanding performances of top DCI corps when Drum Corps at the Movies marches into theaters this summer for two one-night-only events. Theater-goers will experience a historic first on Monday, June 20, when the top eight finishers from the 2010 DCI World Championship share the silver screen for the "2011 Tour Premiere," a competitive event that will be taped in high definition one night earlier in Round Rock, Texas. Featured in this special early-season performance will be the 2011 productions of Blue Devils, Blue Stars, Bluecoats, The Cadets, Carolina Crown, The Cavaliers, Phantom Regiment and Santa Clara Vanguard. "It's historic in that never before have the top eight scoring DCI corps from one season come together in one place to start the next season together," said DCI Executive Director Dan Acheson. "These corps will meet in Texas for two exciting season kickoff events, beginning Saturday, June 18 in Saginaw, Texas and continuing onto Round Rock on Sunday the 19th. We'll record the live performances on Sunday night for the Monday evening broadcast, but the scores from both shows will not be known until they are revealed exclusively at the conclusion of the theater event." With different slates of DCI judges for each of the two Texas events, and a change in performance order from Saturday night to Sunday (corps performing first one night will perform last the next), theater attendees will be treated to added intrigue as the show unfolds on the big screen and the scores are presented. "Fans at the Saturday and Sunday events will also help contribute to history in the making when they select their favorite performances during these two great shows," Acheson added. "The official final scores and caption recaps, however, will remain unknown to anyone other than myself and a select few members of the broadcast production crew. The judges, corps directors, staff and marching members will not know the results until those in the theaters on Monday hear the scores." A complete list of participating theaters is currently available at FathomEvents.com, and tickets will go on sale beginning Friday, May 20. RSVP to the "2011 Tour Premiere" on Facebook. DCI's popular "Big, Loud & Live" cinecast will return for an eighth season on Thursday, Aug. 11. Broadcast in high definition to movie theaters nationwide, this event will capture the action from the 2011 World Championship Prelims at Lucas Oil Stadium in Indianapolis, Ind. With more than 38,400 in attendance at nearly 500 movie theaters nationwide in 2010, annually the "Big, Loud & Live" series continues to grow. The event has allowed fans who are unable attend the World Championships to experience and enjoy the thrills and drama of the world's best drum corps at the climax of the season. Additional details about this year's "Big, Loud & Live" event including a complete list of participating theaters will be released in the coming months at DCI.org/cinema.